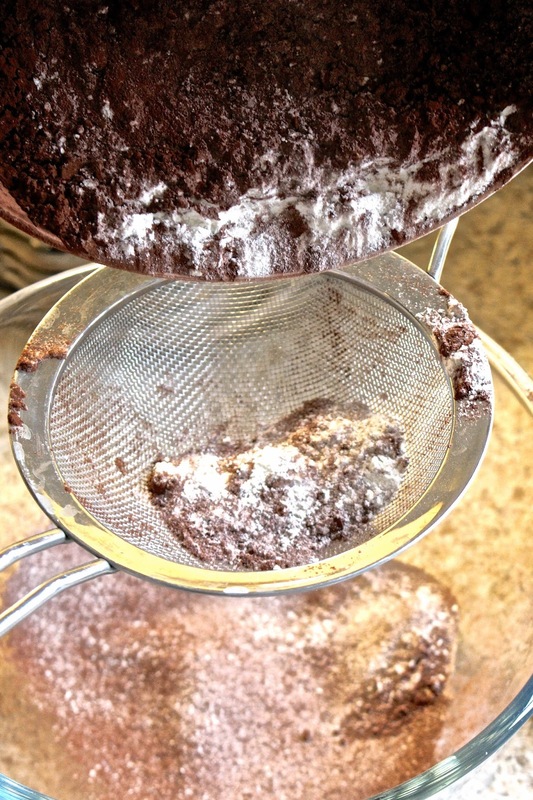 Now, I've tried more than my fair share of cookies over the years and so as a self-proclaimed chocoholic, I had high hopes for this recipe. I'll cut to the chase, I was hugely impressed! The batch whipped up eighteen delicious cookies, each one boasting the gooey result of 300g Green & Black's Milk Cooking Chocolate. I could have made the chunks of chocolate smaller, though there seemed little fun in that and so instead, I broke each branded piece into simple halves for optimum impact and ultimate ooze. Fifteen minutes of preparation followed by ten speedy minutes in the oven and voila! Cookies! Mmm. After immediately munching one of the cookies (and simultaneously berating myself for not taking notice of recommended cooling times), all that remained was to wait, divide them with greaseproof paper and challenge myself not to eat too many in one go. Needless to say, I failed that challenge. So, if you're looking to up your 'cookie game' and try a recipe that really packs a punch, I'd definitely recommend giving this one a go! Omg these honestly look incredible!! OH my god. I need to make these ASAP. These photos are great, and now I'll be scouring my cabinets for ingredients! Wow these look amazing! Love how you used the large chunks of chocolate. I'll have to try making them. OH WOW Gaby! What a chef you are:-) These cookies look really delicious. I will try to make at home, sweetheart is a chocoholic like you...hahaha. Have a lovely day. I'd be concerned if you did manage to control your consumption girlie! Holy cow these look incredible. Pinned to try later for sure. And look at you baking! I distinctly remember your qualms against baking hehehe! I knew there was a baker lurking within you. These looks sooooo good! I feel like if I make them, I'll probably won't get enough of it xD I love chocolate! I'd love to eat them! Mmmmm! These look so yummy! I definitely need to try these naughty treats! Yum these cookies look AMAZING!! Thanks for sharing and I'll definitely have to make them for my friend's birthday that's coming up! Wow! They look so delicious! Yummy!! You made me want to get some cookies right now.. These chocolate cookies look so yummy. 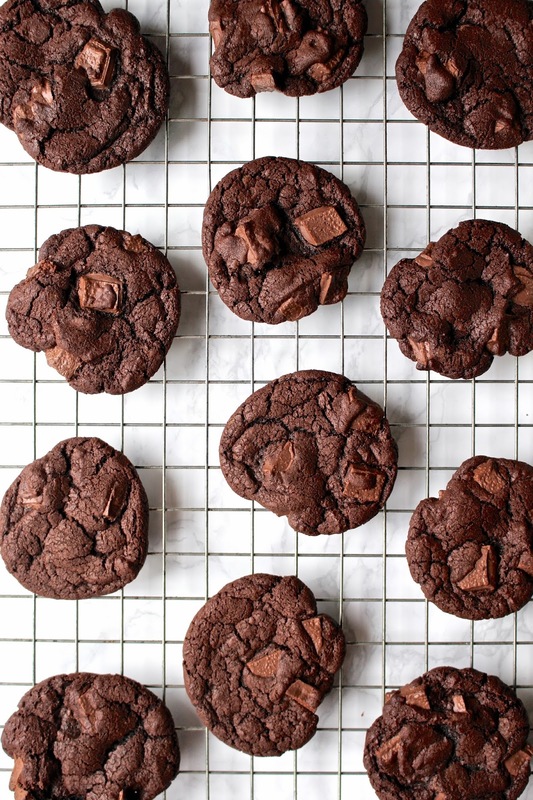 I need to get that cookery book because I'm a love of all things chocolate and these cookies look beyond delicious and are pretty simple to make, even better! Thanks so much of sharing, beauty, and I hope you're having a great day so far! That sounds so good. I would have eaten all of them in one day! These look so amazing oh my god! I think your blog is lovely, let me know if you would like to follow each other! Oh gosh, that makes me want to head into the kitchen and bake! Looks absolutely delicious! I'm now craving cookies they look delicious. omggg those are my type of cookies! Send me some. These looks very, very tasty, and they seem to have come out really well. Good for your friend to gift you the cookery book, and for you to bake these cookies. I'm seriously craving chocolate right now and I just came across this amazing post. These chewy chocolate chip cookies look delicious! Oh my goodness, these look unreal! Delicious! Can't even describe how much of a cookie monster I am, so obviously these look amazing to me! Definitely wouldn't be able to restrain myself though, I usually have to keep myself to about two cookies at a time...if I had the whole batch in front of me I could definitely see myself devouring it. Cookies looks so yummy! I really want to try this! Gabrielle these look so yummy, will be so good with my tea! Oh wow, these are so mouth-watering! Thanks for sharing such an amazing recipe! Oh my these look absolutely scrumptious Gabrielle! And this is coming from someone who doesn't eat cookies. Usually I'm not a fan of chocolate on chocolate on chocolate but I have to admit these look really good! And I've been craving desserts for the longest time haha. I can't believe they made so many cookies too, I'm so tempted to try! Those cookies look delicious! I'm definitely all about chewy cookies over crispy ones and these are making me really hungry. I'm not usually a chocolate cookie fan, but these look fabulous! Your pictures are gorgeous too! i'll have to try these some time! omg, these are to die for! thanks so much for sharing, i can't wait to give it a go! xo! Oh my goodness, they look incredible! Thanks for sharing the recipe, I'll have to try it out. I cannot even try them coz im on diet. but they look so tempting right now. 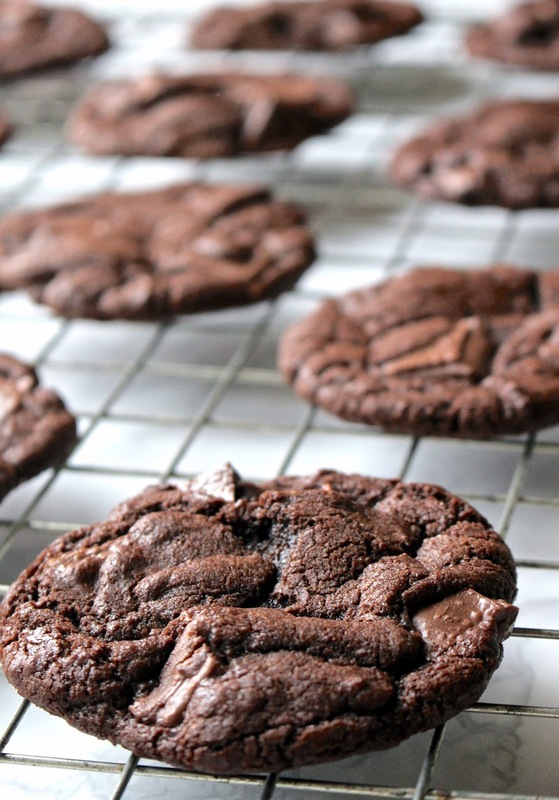 These chocolate cookies look so mouth-watering, I would definitely like to try out the recipe! Thanks for sharing! Yummmm! I want these right now! These look so delicious!! I'd love to make them sometime! These look and sound like an absolute dream! How I love cookies! Yours look SO delicious! :) Enjoy your weekend! I think I am in love! OH MY MY MY! I think I'd eat them all! 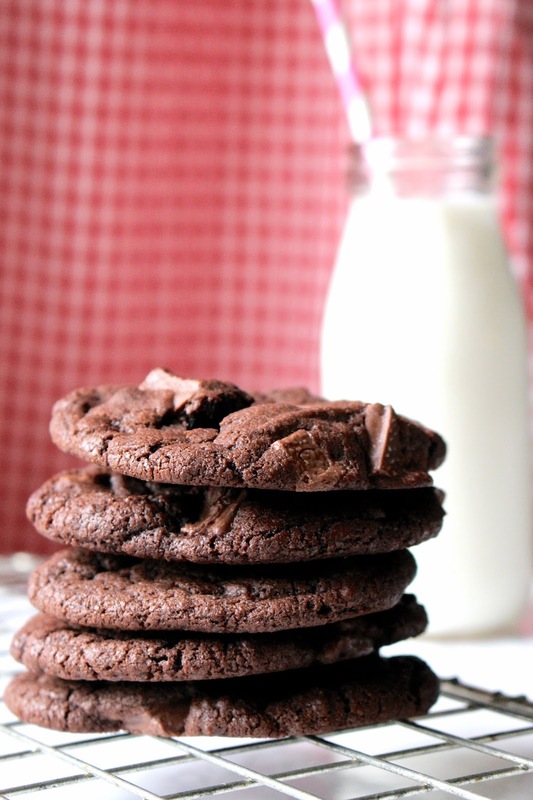 From one chocoholic to another... these cookies look delicious!!! Now I'm hungry, literally. ;) Thanks for sharing the recipe dear! That book sounds sooo dangerously tempting, haha. Omg these looks so delicious! oh my those look so amazing. This looks so tasty, I'm gonna save the ingredients or maybe all the post. I seriously think that I am going to have to make these now! These look so delicious! Love the photos. Thanks for sharing!